Attention passengers! Due to an unexpected zombie apocalypse we will now be making a nonstop trip to episode 105 of Dead Air! In it we talk about the 2016 mega hit Train to Busan! Seok-woo is a workaholic with a young daughter named Soo-an. On her birthday she wants nothing more than to visit her mother in Busan. With Seok-woo reluctantly in tow it’s about to be the most intense ride of their loves. A zombie outbreaks gives us a teaming mass of fast and relentless undead. With the population of Korea being quickly converted and the military seemingly unable to stop it. The train to Busan could very well be the last safe place on earth! Except the infection is aboard and the passengers are succumbing car by car. Can Seok-woo and Soo-an make it to Busan? Even if they do, what will be left of it when they arrive? Find out, now! When it comes to Asian horror I try not to differentiate much between what we view here in the west and what is viewed in Korea or Japan. So treating it as a sub-genre within horror isn’t really my style. I would love to boast about how I liked this sort of stuff before it was cool and that you are all sheep herded into liking it by such box office giants as The Ring or The Grudge, but I truthfully never gave much thought to Asian horror. I noticed (as I tend to) that there was this steady stream of supernatural horrors coming out to the theaters. Furthermore, I noticed that most of these are remakes of horror movies from Asia, so I became interested in what the originals were like. I was pretty lucky growing up because my parents always had a collection of stations dedicated to playing movies of various ages. They also had a lot of foreign stuff coming out of Japan which enabled me to watch Ringu and then Ju-oh, the source material for The Ring and The Grudge respectively. I liked them but they were different. I noticed they were slower in pace and a little bit more abstract. I felt like maybe I was taking Western horror for granted. In my opinion we like to have things spelled out for us more than some foreign films. It wasn’t long afterwards that a film called Whispering Corridors became known to me. 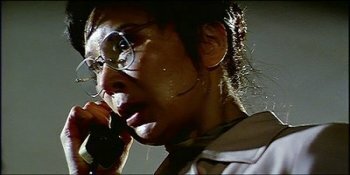 It was really a casual conversation among friends and someone mentioned that this Asian horror boom could be traced back to this one film. Needless to say I was pretty interested in watching it but alas my good intentions fell to the wayside. Thankfully things like Netflix exist to force me to toss away all my excuses about films that are less convenient for me to find. Whispering Corridors was released in 1998, and directed by Ki-hyeong Park, Park also took part in writing the film along with Jung-Ok In. The film focuses on an all-girl’s school in South Korea where the students are taught to consider each other as rivals. The teachers run the gambit as normal to extremely harsh. The film opens up with one of these teachers murdered by some unknown force. A senior student named Ji-oh (Gyu-ri Kim) discovers the body of the teacher handing from an overpass. She and several other students who witness this are swore to secrecy by their teachers because they don’t want anyone like the press snooping around at the school. Ji-oh is a somewhat bizarre girl who many of the students believe has supernatural powers. She attempts to communicate to the dead and even goes so far as to paint the image of the murdered teacher in her art class. Most of the teachers dismiss her as hopeless. One of the teachers is a former student named Miss Hur (Mi-yeon Lee) she still feels a bit out of place and somewhat like a student still. She has a closer relationship to a lot of the students and tries to help them while trying to figure out what is going on It’s also revealed that the murdered teacher (now being claimed as a suicide) contacted her moments before her death claiming that Jin-ju is alive. Jin-Ju being miss Hur’s high-school friend who committed suicide. The rest of the film has various girls who go through their daily school lives where they’re grades and future social standings are pitted against each other. As the film progresses more mysterious are unveiled and more tragic realities of a lot of the girls pasts come to light. Of course there is more death. Where I think most people can agree why this movie never made it to the mainstream western audiences like The Grudge or The Ring is its slow pace. And it is very slow. I didn’t find myself bothered by the pacing but I could easily see the standard western movie crowd having a different idea of what a horror movie should be. What I felt was refreshing was the genuinely well acted scenes and the interesting characters. There is a low body count but I found myself legitimately worried if certain characters were going to die or not. The ending is excellent although a bit confusing until you have a minute to think about it. I felt like the film did take things for granted in terms of how the teachers and students conducted themselves. I chalked it up to me simply not being South Korean and this film probably was never intended for a westerner to watch it. I’m frankly glad this one was never remade like a lot of the other horror films coming out of Asia and no I’m not saying that I dislike remakes of J-horror or things of that ilk. I’m just saying that in this case I feel like a remake would most certainly try to drive the pace, or ramp up the body count. The film is fine on its own and serves as a reminder about the artificial barriers we put between each other. Whether or not you can still be friends with someone who has lower grades, or what being friends with someone of a lower social standing could do to your own reputation. The film attempts to drive home the argument that it these sorts of things can take something that everyone wants to cherish – like the memories of friends and happy times in high-school, and turn them into a horror we all wish we could forget. I highly recommend anyone interested in the supernatural to check this one out. It’s a different kind of horror that has all the elements but serves better as a mystery than something really intended to scare or shock. That being said, it definitely has set a standard over the past ten years about how we tell these stories.